July 18, 2018 is National Hot Dog Day and several chains are celebrating with a freebies or deal. 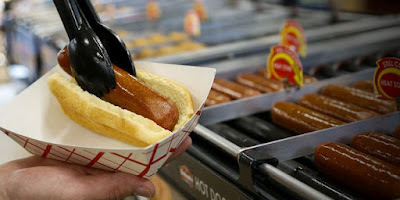 - 7-Eleven - $1 Big Bite Hot Dogs on July 18, 2018. - Dog Haus - Free Haus Dog on July 18, 2018 for first-time app users (you need to download the app and register an account) at participating locations, while supplies last. - Love's Travel Stops - Free hot dog or roller grill item on July 18, 2018 via their mobile app. - Pilot Flying J - Free hot dog or roller grill item on July 18, 2018 via their mobile app. - Portillo's - Two regular hot dogs for $5 through July 22, 2018. - Sonic - $1 Hot Dogs on July 18, 2018 when you text 876642. Limit 5. You must mention text to get the the deal. - Wienerschnitzel - 5 Chili Dogs for $5 at participating locations on July 18, 2018. Photo via Love's Travel Stops.